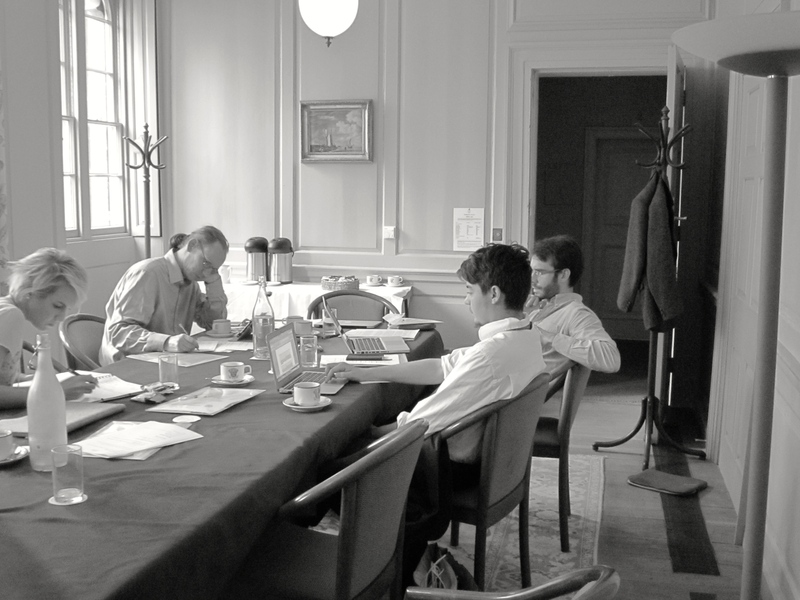 It is two weeks since our workshop meeting in Oxford, as part of the Pembroke College Mahfouz Forum, and, as Tom and Ulrike’s posts demonstrate, it has inspired a great deal of thinking and reflection. The Ordered Universe team were extremely grateful to the Mahfouz Forum for funding the workshop, and allowing us to invite new participants as well as familiar faces. 20 or so of us, and from a wonderful array of disciplines, and all to bring focus to one of Grosseteste’s earliest texts. We did in fact start the workshop on the Wednesday afternoon with a planning session for the next phase of the project: moving to the ten remaining scientific treatises and testing how we present the idea of the project to each other and to the wider communities to which we belong. Hannah and I led the meeting, with Richard, Mike, Devin, Sig and John, and made solid progress. The session also included the trial run for Clive’s amazing chladni plates, much to our delight and amazement. Our other participants arrived throughout the afternoon and evening. The workshop proper began on the Thursday with two more discursive presentations. The first, by Giles, Mike and Sigbjørn outlined the place of the De generatione sonorum within Grosseteste’s career and lifetime, and something of Aristotle’s thought on sound. The treatise is intriguing, and one where Grosseteste’s growing familiarity with his sources can be traced, in some detail. Where the treatise on the Liberal Arts discusses sound, it does so with emphasis on Augustine of Hippo’s deliberation on the subject. By the De generatione sonorum Grosseteste is familiar with the De Anima of Aristotle, most probably in the translation by James of Venice, which affects considerably his presentation of how sound is produced. Grosseteste would develop his view on sound again, in the course of his sustained engagement with the Posterior Analytics and the commentary he composed to this work, in the 1220s. Sound, then, provides a very useful insight into his working practices. Cecilia’s 1998 article on the treatise provides a very useful overview of the treatise and the place of sound within Grosseteste’s scientific oeuvre (‘Robert Grosseteste’s Theory of Sound’, in F. Hentschel ed. Musik – und die Geschichte der Philosophie und Naturwissenschaften im Mittelalter. Fragen zur Wechselwirkung von ‘Musica’ und ‘Philosophia’ im Mittelalter (Leiden: Brill, 1998), pp. 3-18). The treatise as it stands is also in sore need of a new edition: the manuscript tradition provides different readings at key moments to Baur’s edition. The second presentation made by Hannah, Tom and Brian, gave a conspectus on the modern understanding of sound, oscillating waves, frequencies and pitch. It made for fascinating listening, and was a dynamic and instructive display, with number of demonstrations. Afterwards Clive made his Chladni plate debut (see previous post), with great panache, for the whole research group, on the Isaacson balcony. With the opening sessions completed, which were extremely useful to set the context for Grosseteste’s treatise and how to think about sound, we then embarked on our collaborative reading.